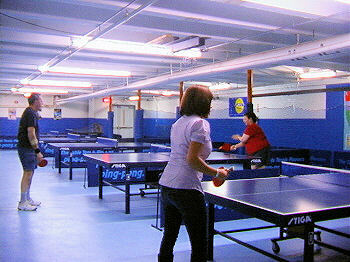 We are the ONLY organized table tennis league or club in the State of Maine, USA. We are located at the Lewiston Armory, 65 Central Avenue, in Lewiston, Maine ... a city owned facility. At present our League consists of 85 players...men, women, teenagers, and middle school youngsters. We started back in 1996 and are beginning our 20th season of organized table tennis. We play 3 evenings a week, Monday, Wednesday and Thursday evenings. We presently have 9 tables, plus 1 table set up with a robot. We are members of the USATT as well as Ratings Central, and sponsor 2 in-house tournaments every year. We have 1 Killerspin Revolution table, 1 Butterfly Centrefold 25 Sky Rollaway, and 8 Stiga Expert tables to play on. Our League has the only certified referee in the State of Maine. Dues are $40.00 per year for adults, and $30.00 for those 12 and under. The Maine Champions, both for males and females are members of our League. We will hold the MAINE STATE CHAMPIONSHIP TOURNAMENT on Nov. 19th 2016. Only MAINE PLAYERS are allowed to play in this designated tournament. Visitors are always welcome and for those wishing not to join, they may elect to pay $5.00 per session if they so desire. We have, for the convenience of the players, a well stocked soda machine as well as a water cooler. Players may elect to purchase professional table tennis equipment via the League, at substantial savings. We are sponsored by Stiga, and by Paddle Palace when it comes to tournaments.